This all-natural skin care product is designed to reduce the appearance of age spots, sun damage and other types of skin discolouration. After using it for two months, I can confirm that it does just that but in such a gentle, non-invasive way that you may not even notice at first. I accepted a sample of this product for an independent evaluation and, as usual, I discontinued any similar products so as to properly observe any results. As usual with these discolouration problems, results are very slow to show, but with patience I have seen a definite improvement. In my case the damage was progressive and it started many years ago, so I did not expect a quick solution. Also, stupidly, I used a self tanner product in November and, while it gave my legs and body a lovely tan, it reactivated the melanin in my sun-damaged face, and my cheek again looked like a map of the Hebrides. However, with regular, twice-daily use, my skin tone is becoming more even and most stains are almost invisible. The product is a thick white lotion. It is dispensed by a pump applicator and I find one medium squeeze sufficient for my whole face. I'm using it on the back of my hands, as well. 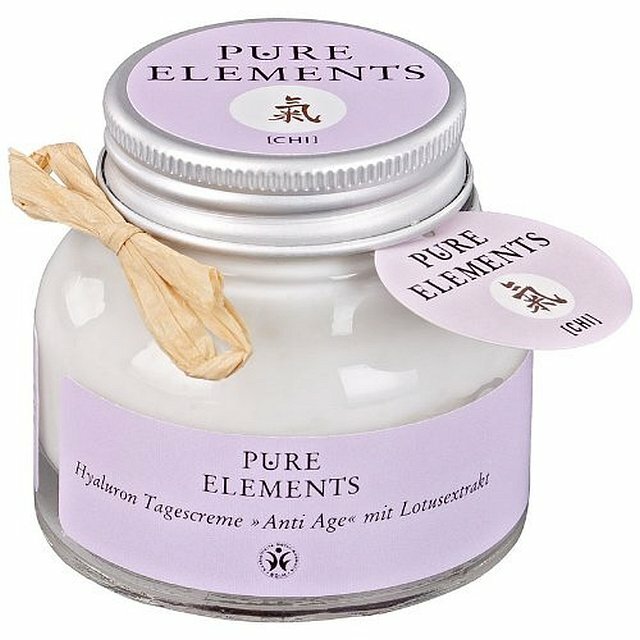 Apart from the fading effect, this cream is a lovely moisturizer with a fresh herbal scent, suitable for use under makeup as it does not leave a greasy residue. It has not triggered any allergic reactions and did not cause my skin to break out. The main active ingredient, Mandelic Acid, is derived from an extract of bitter almonds, and has been used extensively as an antibacterial agent and to fight certain infections. Like other products from this range, this cream is packed with essential oils, the idea being that we are all different and we respond to different things. I hope you find this treatment as helpful as I did, but be patient and give it a fair test. By week four you should be able to see if it works for you. I should add that I treat it as a serum; I am 62 and my skin requires layers of nourishing creams. You can customize its use depending on your age, skin type and level of dryness. 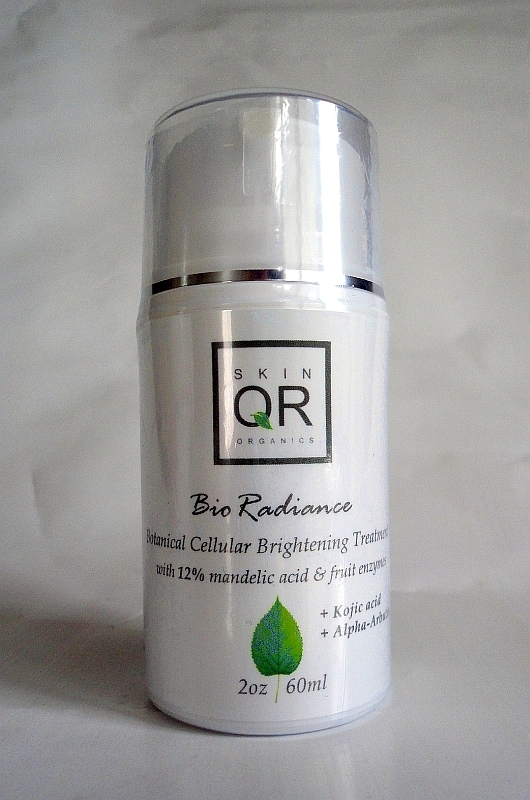 I was sent a sample and asked to test this toner in combination with the BioRadiance Botanical Cellular Brightening Treatment by the same brand. Reading the list of ingredients, and the caution that it is not suitable for sensitive skin, I expected a harsh product. Nothing of the sort! This is one of the best toners I have ever used. My skin is sensitive and made fragile by age, allergies and careless sun exposure, but I can use this every day without irritating my face. Granted it is winter; in the summer, I would have to be cautious of its interaction with the sun and, perhaps, just use it at night, but for now it's great. All the acids listed are of natural origin (mostly derived from fruits), as are all the products in this range, but that doesn't mean that they are not powerful. My usual test for a toner is to put a few drops on a cotton cosmetic pad and wipe my face AFTER my usual cleansing routine. I am always amazed to see the amount of residual impurities that show up on the pad when I use this toner. I believe it does exfoliate as well as close the pores and refresh my skin. This is quite a big bottle (6 oz or 180 ml) and can last me a couple of months easily. If you have dark spots and discolouration, as I do, this is the perfect toner to use to complement the action of the BioRadiance Brightening Treatment (or whatever else you use to fade the hyper pigmented problem areas). If not, it is still a great choice as it provides gentle exfoliation as a bonus. 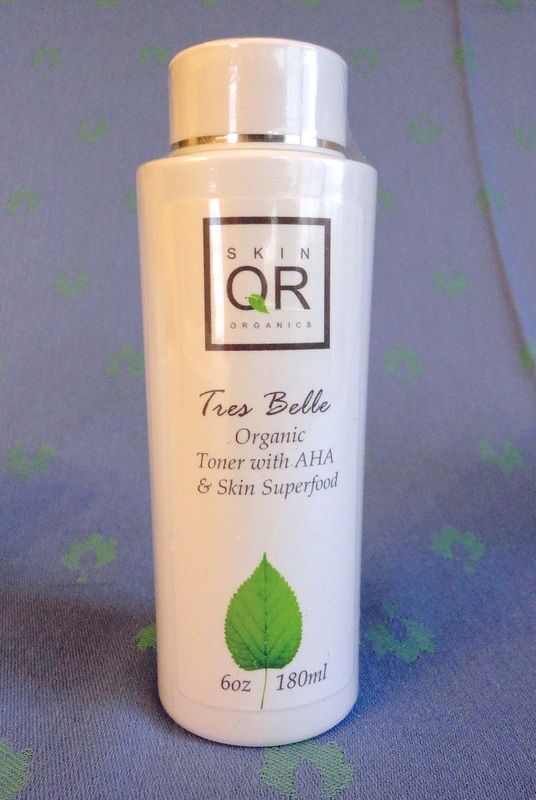 I have tried several skin care products by Skin QR Organics over the past year, and they have all been effective for me. I am really impressed with the whole range and their commitment to natural solutions. I am a great believer in the benefits of essential oils, and this brand takes the guesswork out of using them. What a wonderful day cream! A silky, rich but non-greasy texture with a light, fresh floral scent, more citrus-y than sweet (I imagine it's the lotus flower). My skin drinks it quickly and I often apply a second coat, just because it feels so good. It makes a great base for make-up, it's absorbed quickly and is suitable for the most delicate skin. The ingredients are allergen-free, natural and highly nourishing: Shea Butter, Almond Oil, Natural Vitamin E and Lotus Extract. The description says it's for “demanding skins”, which is what mine has become since passing my 60th birthday. Despite containing three kinds of Hyaluronic Acids (the miracle ingredient in today's most effective anti-ageing skin care), it is mild enough that I have been using it on my eye contour as well, with no irritation or any signs of intolerance. It's rare that I can put a cream not specifically formulated for around the eyes on that most fragile part of my face. This cream is all the daytime protection my face needs to keep fine lines at bay and to counteract the skin drying effects of winter. The beautiful glass jar holds 50ml of cream, which I think should last me a couple of months. At this price, it is very affordable and I love that it is made from all natural ingredients without any artificial fragrances, colouring, allergens or parabens. It's been ages since I last used a lip balm, mostly because they tend to be thick and sticky. My usual thing is lip gloss, either clear or tinted. However, lately my lips have started to chap; uncharacteristic, but still very annoying. 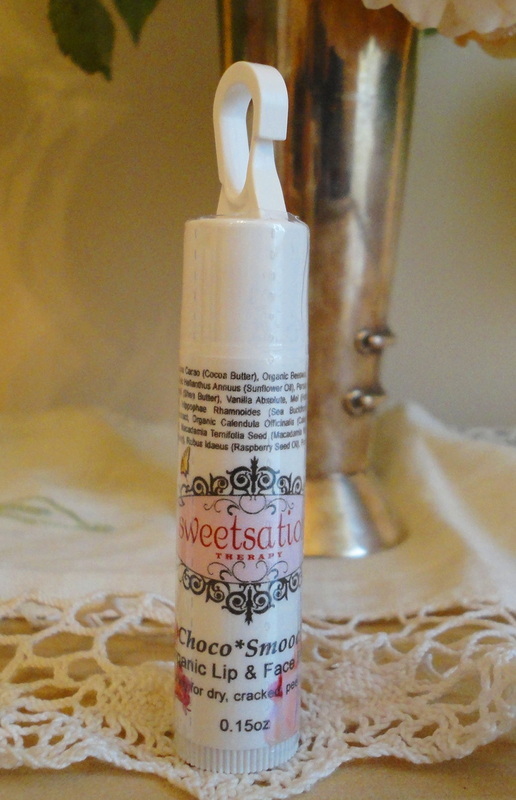 This lip balm arrived as a welcome little extra with other products from Sweetsation Therapy and I was pleasantly surprised. The ingredients are practically food-quality and I love anything that smells of chocolate! I'm a great believer in the virtues of calendula to heal skin problems and, in addition, there are other all-natural ingredients like Argan oil, Macadamia and berry seed oils. Formulated to be safe for babies, but so good also for adults with sensitive skin, especially in winter. The snap link on the cap is a clever idea to keep the lip balm handy and within easy reach, attached to a zip or winter jacket. 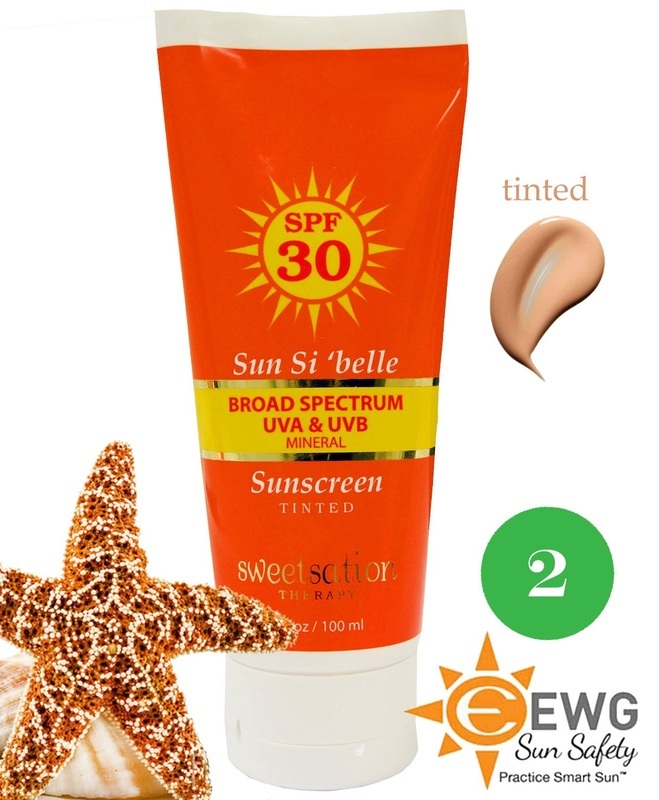 This all-natural product aims to tackle the difficult problem of stubborn, sun-related skin discolouration. I first noticed the stains on my face after a particularly sunny summer, but I think the damage had been gradual and cumulative. It looked like someone had splashed coffee over my cheeks and forehead and, once my tan started to fade, the stains were very evident and very ugly. Several products I used in the past year had brought about some improvement, and of course, the winter low light conditions meant that the melanin overload eased a little, but the core stains remained. However, I was not willing to bleach my face with just any unknown product. I had already tested some of the Sweetsation Therapy range and liked the results and the brand's philosophy of using only natural, non-toxic ingredients. So I accepted a sample of this treatment … with very low expectations, I might add. The dense, white lotion comes in a pump-operated canister containing 60 ml, a fair amount considering how little is needed each time. The aroma is like fresh fruit and botanical extracts, not your usual face cream artificial perfume. I like it and it doesn't linger. I have been using this cream for 3 weeks now. I apply it all over my face twice a day, after cleansing. In the morning, I follow with Sweetsation's Sun Si'belle Sun Screen, which is rated SPF 30 and tinted (as with all skin lightening products, it is imperative to protect your skin with a good sun screen during the treatment); in the evening, I layer it with a night moisturizing cream. Casting an eye on the very long list of ingredients, it is clear that this preparation has nutritive properties (all those essential oils, aloe, sunflower oil, coconut oil, jojoba oil, etc.) but at my age I need to top it with another moisturizer. So, it's okay to layer, just use whatever skin care you normally use for the day on top of the Lumi*Essence and sun screen. As usual with this type of skin care, results take time and perseverance, but I am already very pleased with the change. My stains are fading and now I have to remember where specifically the worst bits were, so I can give those areas an extra deep massage. I was assured that this is not a bleaching formula and is, therefore, suitable for anyone with sun damage. So, if you have this kind of discolouration, dark splotches and uneven skin tone, you might want to try this gentle but effective product before giving up. I hope it works as well for you as it is for me. I will update this review, should anything change down the road, but for now, this repair treatment is a winner, and something I am happy to recommend for even the most sensitive skins (like mine). A complex fruity scent announces the rich cocktail of fruit and botanical extracts which have been combined in this powerful serum. Intended for once-daily application, the 1.5% Vitamin A (Retinol) content may well require a gradual approach, especially if your skin has not been exposed to it before. Mine had, so I was able to start using this serum every night. It is a semi-clear gel with a little more body than my last one and takes a little bit longer to be absorbed by my skin. I use the time to lightly massage my face. Once dry, my skin feels toned, refreshed and ready for a night-time moisturizer. Among the other ingredients are 15% Vitamin C, Ferulic Acid (from rice bran oil), Aloe Vera, Rose Seed Oil, MSM, Botanical Hyaluronic Acid and a whole list of my favourite essential oils. It is packed with skin-friendly vitamins and none of the artificial fragrances, colour agents, parabens and noxious additives so prevalent in other brands. When Sweetsation Therapy asked me to try out some of their products, the name was new to me. I visited their website and was fascinated to learn that the brand was created by an expectant mother who could not find “safe” skincare to use during her pregnancy. Her philosophy is so much in line with what I believe in. At 61, my skin has become extremely sensitive so I am always delighted to discover a new brand committed to pure and natural ingredients. So, having used the Bio'Sensiya serum for a full three weeks, I can say that my skin loves this serum. It says to avoid the eye area. I had forgotten that and, for the first week, I applied it to my entire face and neck, including the eye contour. No irritation, no sensitivity. I am not suggesting that you should ignore the recommendation, only that my fragile skin had no problem with the product. From the very first applications, I noticed a tighter skin tone and a clearer look to my face. 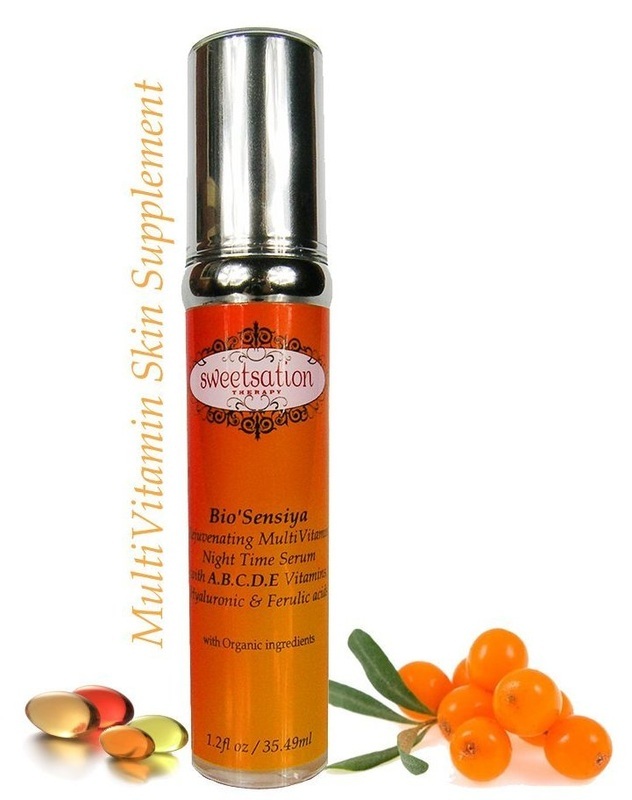 I had started to address some sun- and age-related pigmentation and this serum is proving to be just as good as the other excellent products I had been using. At this rate, I have good hopes of removing most of the discolouration before next summer, and to me that is a huge deal. The deep lines around my mouth are easing, and the dehydration and loss of collagen in the rest of my face is much less evident. This serum is packaged in a pump-operated plastic bottle containing 1.2 fluid ounces, which is pretty standard for a serum. Because you need so little, this quantity should last at least a couple of months, making the price very affordable. I would normally assess an anti-ageing product for five or six weeks before commenting, but this serums is working so well for me that I feel comfortable reporting this early improvement. I'm using a sun screen in the middle of winter not because I'm on a sunny holiday (I wish! ), but because it is an essential complement to Sweetsation's Lumi*Essence Brightening Repair Treatment, which I am testing on my stubborn sun-damaged stains. I normally avoid sun screens (and have the marks to prove it! ), but I must admit this one is really different. I love the fact that it's tinted and the texture is very rich and silky. On my face a little is all that's needed and I find it easy to apply evenly. If I'm going out wearing make-up, this sun screen acts exactly like a tinted primer, so I just blot away the surface shine before applying powder. No foundation necessary and the very natural tint seems to suit my medium skin tone perfectly. The soft plastic tube contains 100 ml, which is pretty standard but, because it's so rich, should last a long time. Like the rest of the Sweetsation Therapy range, the formulation is cruelty-free and does not contain any toxic ingredients (the main reason I was not a fan of sun blocks). Apart from the UV-blocking ingredients, the rest of the list reads like a powerful anti-ageing moisturizer, so it's like getting two creams in one. An excellent product that I will happily continue to use this summer to protect my skin from further damage.